This short tutorial are devided so that we will learn how to install Statsmodels and Pandas, carrying out one-way and two-way ANOVA using statsmodels. Finally, there is a YouTube video showing how to carry out repeated measures ANOVA using Statsmodels and R. This Youtube video will also show some of the differences between Statsmodel and the r-package afex and the function aov_ez. data: the first argument should be a dataframe object. within: the within-subject factors in a lit of strings. aggregate_func: this is optional and should be use if the data contains more than a single observation per participant. Can be “mean” or a function. For instance, you can use Numpy mean (i.e., np.mean). First we start with the one-way ANOVA. In the examples below we are going to use Pandas and the AnovaRM class from statsmodels. In the first example, we are using Pandas to use read_csv to load this data into a dataframe. 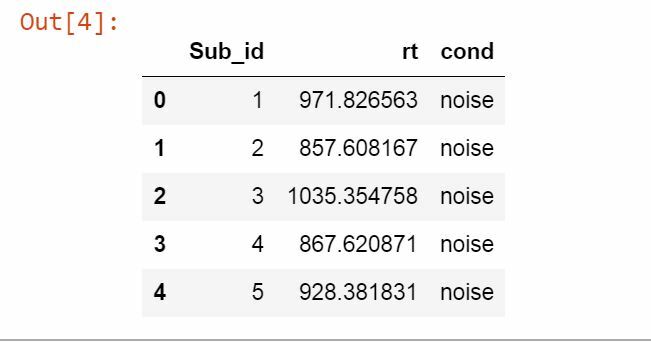 See my Python Pandas Dataframe tutorial if you need to learn more about Pandas dataframes. First 5 rows of the Pandas dataframe. As can be seen above we have the columns Sub_id, rt, and cond. These columns represent the subject identifier, the dependent variable, and the independent variable, respectively. Note, there are two levels of cond (using df.cond.unique() will show us noise and quiet). In the Statsmodels ANOVA example below we use our dataframe object, df, as the first argument, followed by our independent variable (‘rt’), subject identifier (‘Sub_id’), and the list of the dependend variable, ‘cond’. In the second row we are getting the fit so that we can print the ANOVA table. In the second example we will also use the parameter aggregate_func. Click here to download the dataset. Finally, we continue with the two-way ANOVA. In the example below we are also using Pandas and the AnovaRM class from statsmodels. The example data can be downloaded here. Notice the difference between the one-way ANOVA and the two-way ANOVA; the list now contains 2 variables. Finally, here’s the YouTube video covering how to carry out repeated measures ANOVA using Python and R. It will further show some of the differences between the function aov_ez and AnovaRM. Hint, there are more arguments available in aov_ez and it will calculate effect sizes, among other things. That was it, now you know how to carry out one-way and two-way ANOVA for repeated measures using Python Statsmodels. Hey, thanks for the awesome tutorials! They have been super helpful. Just wanted to let you know that your link for the github data under the header”Two-way ANOVA for Repeated Measures Using Statsmodels” is the same as the link for the one-way. I was able to find the data for that data set by simply changing the “rmAOV1way” to “rmAOV2way” in the URL, but others might not realize the data isn’t right for the 2 way model. Hey Andrew! Glad you found them helpful! Thank you for your comment about the example data. I’ve updated the post to point at the right CSV file. Again, thanks!